Get the look of white gold for less! This 5 millimeter wide 925 sterling silver wedding band is the perfect ring to celebrate your marriage. 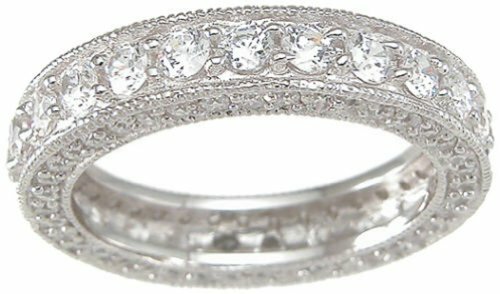 High quality sterling silver anniversary band ring featuring AAA quality CZ stones prong set all the way around the ring and pave set CZ stones on the face of the ring. This is not cheap imitation jewelry. This is a high quality precision manufactured silver wedding band ring with the same attention to detail you find in expensive rings. This wedding band looks real, at an affordable price and we proudly offer it exclusively in sizes 5 6 7 8 & 9. VINTAGE STYLE ANNIVERSARY RING FOR WOMEN: Created in with the finest materials this sterling silver ring features AAA quality cubic zirconia stones all the way around the ring in an anniversary style. This is not cheap immitation jewelry. This is a high quality precision manufactured silver wedding band ring with the same attention to detail you find in expensive rings. This wedding band looks real, at an affordable price and we proudly offer it exclusively in sizes 5 6 7 8 & 9.